In anticipation of National Flash Fiction Day, with the competition closing this month – April 30 (comp rules here), we point you to the NFFD Flash News page where you can see how flash is heating up around the world. Highlights include Rebecca Simons in conversation with Celine Gibson on Canterbury Plains radio, plus Flash Fiction Fever, a special programme devoted to flash; Steve Charters being short-listed for the Commonwealth Prize; Frankie McMillan featured in The Press; Owen Marshall’s poetry and a brief discussion of poetry and prose; the new Flash Fiction International (released this month) and the forthcoming Best Small Fictions (September 2015), including NZ writer Jane Swan – and more. Christopher Allen: “The often condensed syntax of sudden fiction represents a uniquely contemporary voice. Trimming syntax urges the eye along so that the reader experiences text almost in a single moment.” More here. Townsend Walker: “The wind ponies of my mind take me to places I’ve never been. They race across plains of thought heedless of what they’ve never seen.” More here. James Claffey: “My writing is fueled by memory and time and distance, and those three constructs lend themselves to a fragmentary sort of storytelling.” More here. Kyle Hemmings: “I like flash because it can hit you good and fast and hard. It can hit you in the gut like nothing can. It can stay with you like a song.” More here. Michelle Elvy: “Jump right in. Don’t beat around the bush. Start in the middle, or even at the end. Make the first line count: it can make or break a story. Surprise yourself and your readers. Experiment. Play. Remember that what you omit is as important as what you say. There’s beauty between words – in the space you create, at the edges of the story.” Read more here. Kathy Fish (Guest Editor of Flash Frontier, forthcoming, September 2015): “We all have experienced that frozen feeling when faced with the blank page. This is an exercise I have used often and it’s never failed to produce a piece of fiction: Your goal is to write fifty sentences as quickly as you can. The sentences needn’t be connected in any way. In fact, it’s better if they aren’t. Allow yourself to write whatever comes to mind no matter how weird…” Read the rest here. Gay Degani: “Words are precious in any work of fiction. They are the stuff that create mood, reveal character, offer tension, but in flash, each word must be absolutely worth the space it uses. If it does not serve a very specific function, then it must be reconsidered for one that does.” Read more here. 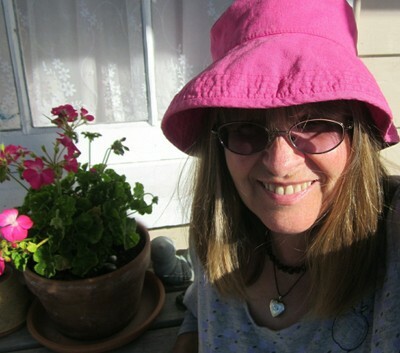 Anna Granger was the winner of the 2014 Short Short Story category of the BNZ Literary Awards with ‘Territories’, and another of her stories, ‘An Ear for Music’, was highly commended in the same competition. 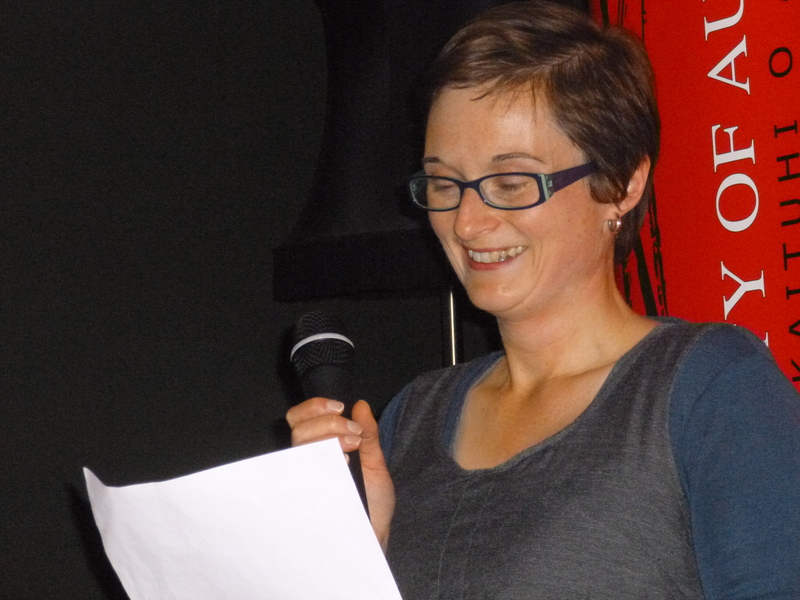 Last year she won the NZSA Central Districts Short Story Competition, and in last month’s Flash Frontier interview, Fiona Kidman mentioned Anna as one of the “one of the finest practitioners of her craft working in this country at present”. On the basis of such praise and success, I wanted to get to know Anna’s stories to see how she achieves success in short short story writing. In this extract from ‘New Fruit Tomorrow’, the winner of the NZSA Central Distracts Short Story Competition, Granger describes her characters precisely, with just one physical feature of each character listed. That precision allows for ambiguity since no other features are described. This man has a wife and a son. She has dark hair and nervous eyes. Her son is sandy like his father. But he is very thin and does not want to eat, and sometimes his mother worries that he will become transparent and somehow disappear. They live on the hill above the town, over the bridge. The sparse setting of the town is like reading directions on a script. The hill, the town and bridge are distinct features, and yet could be anywhere at the same time. The combination of precision and ambiguity give the story an ethereal quality; the characters and situation seem slippery, like they could escape at any moment, while reading brings on the feeling of trying latch onto them, if only temporarily. Anna has managed to take the essence of the larger work (1000 words) and condense the characterisation, setting and emotion to 150 words. You can read ‘Territories’ here. ‘Territories’ reads like a prose poem. The rhythm of the regular sentence length, and the focus on small sensory details, and images, and the tight language reflects the confined space of the shed and the relationship between the boy and his father. I used to read a lot of poetry when I was growing up and I especially liked short pieces that showed me something important or interesting in a few lines or short verses. In those days poetry collections for children and school poetry texts were full of long wordy ballads that to me seemed heavy and dated. Short poems were much more impressive to me. Later, discovering short stories, I was hooked. Probably I just have little patience for plodding through the superfluous. Lengthy is fine if it’s consistently well written and engaging, but I find many novels and films (and some short stories) just too long and saggy. Anna’s economy of language also stems from her career as a journalist and photographer. The stories do feel like photographs, small moments shown that illuminate the lives of the main characters in an effecting and intimate way. When he hears the police car coming he steps aside and sees his mother, just her face with the little hat above it, looking out the back window. She lifts her hand to him and he waves back, but a cloud of dust rises up from the gravel and they are gone. Not only does Anna’s sparse language describe the mother and suggest the intimacy of her relationship with her son, she is literally framed by the window as she would be in an image. We also touched on the appearance of words in our conversation. Anna noted, “I like seeing words on the screen in a nice font so I can see the story emerge in a form very close to how it would appear in print. I’m interested not only in the meaning of words, but also how they sound and how they look…. their form and shape on the page.” But it’s not all fun – even if it’s satisfying in the end. “For me it’s not entirely about enjoyment,” admits Anna. “I write because the ideas and characters come to me. It’s satisfying once it’s done, but it can sometimes be a bit grim getting to that stage. 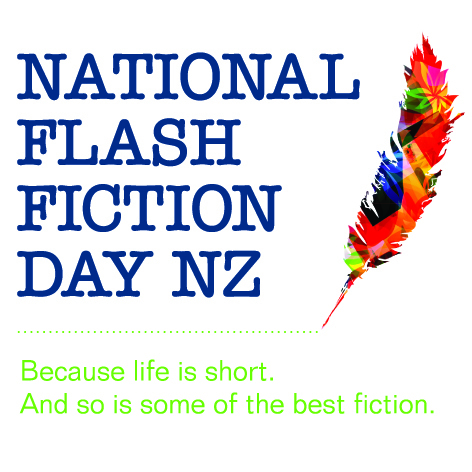 Rebecca Styles is Features Editor at Flash Frontier and Wellington City Co-ordinator for National Flash Fiction Day. She blogs about New Zealand books at nzlit101.blogspot.co.nz and teaches short story writing at the Wellington High School Community Education classes. Please go here for Flash Frontier‘s April 2015 collection of stories, themed iron and guest edited by Tim Jones.